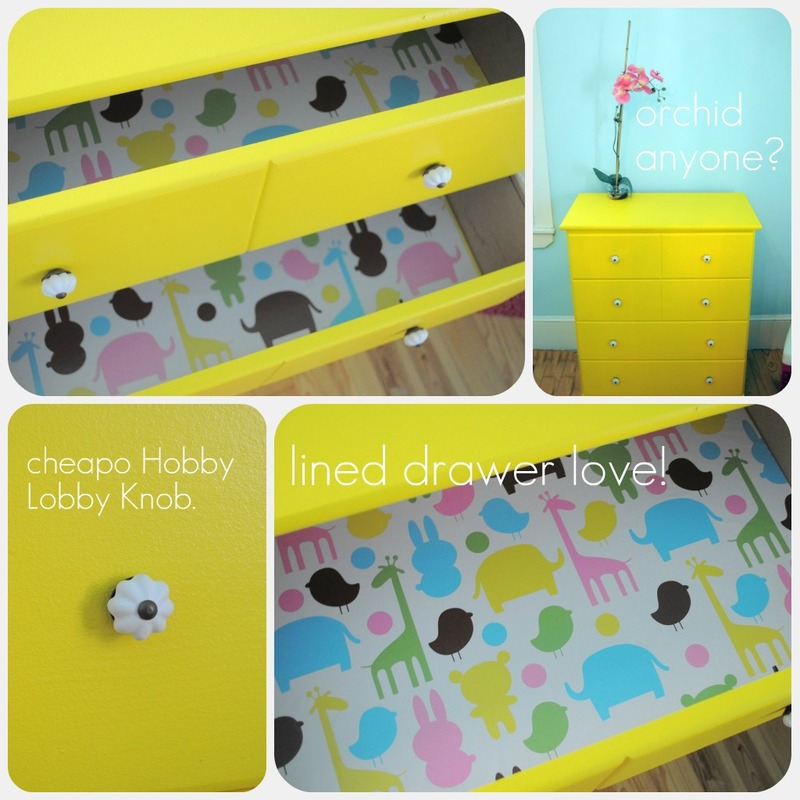 For Genevieve's nursery, I went with an old dresser (see this post) and loved the idea of repeating that for Nadia's nursery. 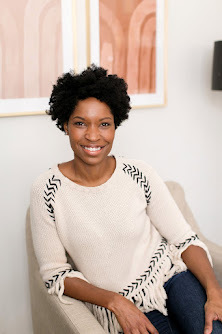 You can usually find something less expensive and with a bit more character and better quality than one you'd find at a furniture store or even a box store. 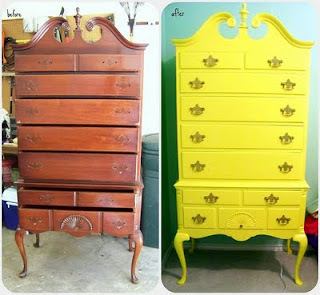 In a happy coincidence, I found the matching dresser to the one I bought for Genevieve at an antique store. It was exactly the same down to the adorable heart cut out at the bottom, but was small enough to fit in the room with the changing table. But when I went to the store the bottom drawer wouldn't open and I knew that would drive me crazy. I was so sad but in the end this other number was cheaper and actually works perfect with the space. It's not quite as high quality- it's basically one of those affordable pieces you'd find at an unfinished furniture store like a the mill store. But at only $20 at a yard sale, it was good enough to do the trick. So now that I'd found the piece it was time to choose a color. The primary colors in my inspiration 'piece' were yellow, blue, and pink. I knew I wanted a cheerful yellow. 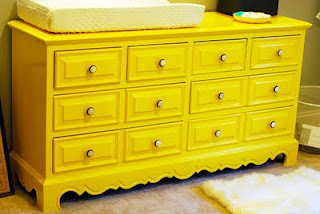 I'd gone back and forth about painting a jenny lind crib a bright yellow (see this post) and love the look of yellow against aqua or pale blue (the color of her walls). Since in the end I decided I didn't have the stamina to tackle a crib project, I figured I could get the same effect with the dresser. 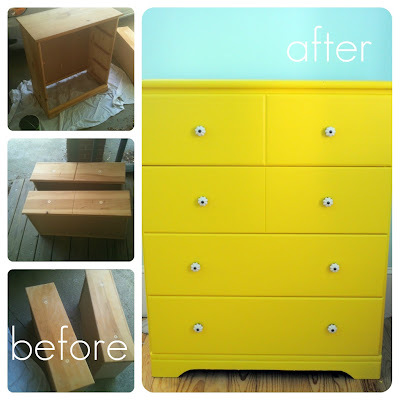 I picked the happiest, truest yellow I could find and went to town. I ended up doing a couple of coats of primer (tinted for the last coat) and then two coats of the yellow paint. For finishing touches, like in this project, I skipped the pricey anthro knobs for Hobby Lobby ones. And they were on sale! This project cost a total of $52. That's a fantastic price for a decent quality dresser, especially after adding unique touches in a fun paint color and 'custom' knobs). 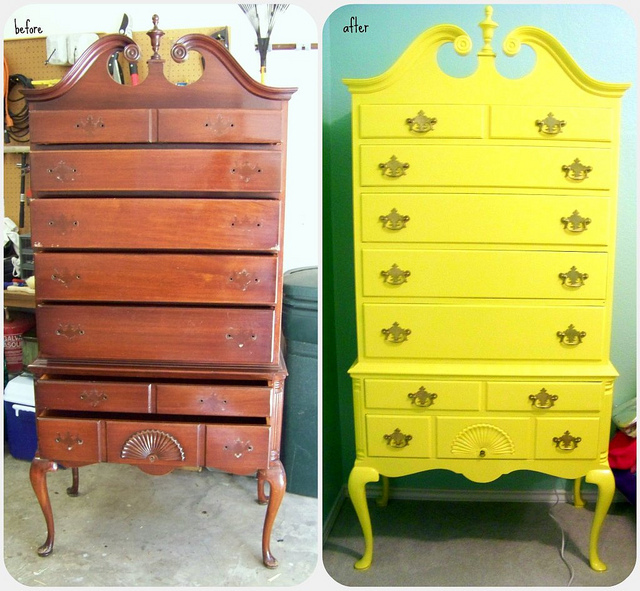 I've included before and after pics, as well as a couple of my inspiration pictures for the dresser. Even though I'm a big fan of paint, I'd never gone with such a bold color so it helped seeing someone else do it with such success. 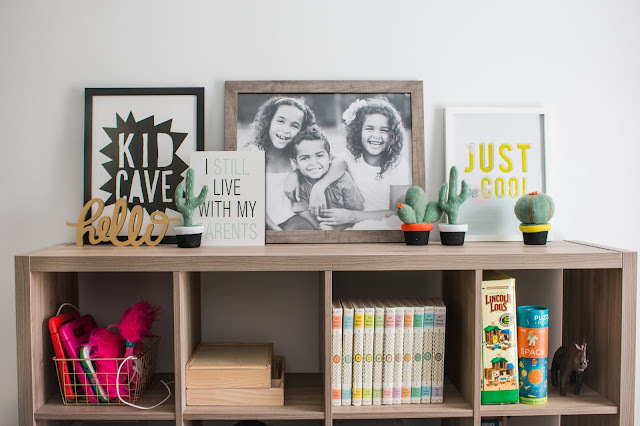 I LOVE color so I don't think I'll tire of it and I could totally see it growing with Nadia or in the girls' playroom later on for extra storage. (uh because right now, we don't have a playroom, or wait, are toys strewn about the house considered a play room because if so, than yeah, we totally have one). I also included the 'better' pics I promised in this post. Oh and please ignore the super close up off center photography. If you want the honest truth I was zoomed in so tight so that I wouldn't have to sweep the trash up around the dresser. Yes I was that tired, exhausted, busy, lazy. As you can see, I've had a ton of fun pulling together old and new pieces for her room. So far, the magazine rack was from the side of the road, the dresser from a yard sale, and the changing table from a thrift/antiques store. Totally loving the re-use, re-purpose, recycle approach to design! Click here for details and to see the before. This girl is amazing! Click here for details- once again, from HiSugarPlum! 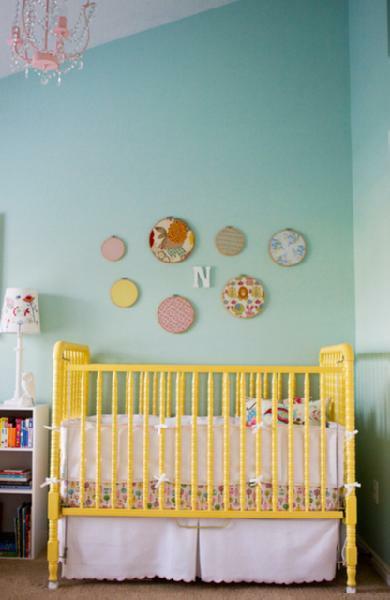 Love the yellow crib against the blue wall. Just darling! From here. What do you think? 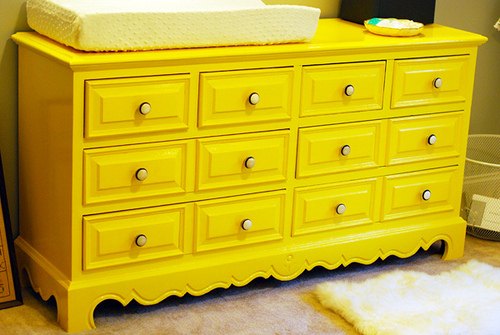 Have you painted any furniture (or anything) a bold color lately? Do share! 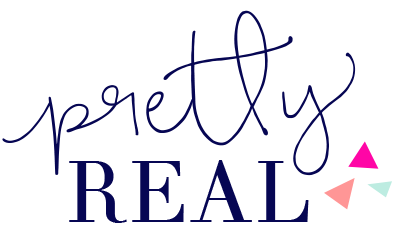 Thanks Jen- and thanks for stopping by our blog!! I love this idea! 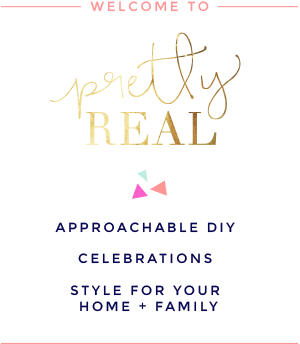 #Mama2Be myself and somehow happened upon your blog post. Glad I did! Great idea. it was really so quick and easy! Thank you!